Featured Products/Solutions — Valley Communications Systems, Inc. - Since 1945! What is an Interactive Projector? You can easily make a dry erase board, plain wall or table into an interactive display. They are the perfect interactive whiteboard alternative. You can create interactive display areas measuring from 60" up to 100" with no extra cost. Pen-based WXGA ultra short-throw interactive display for classrooms. Transform your classroom into a collaborative learning space with the BrightLink 685Wi ultra short-throw WXGA interactive display. Featuring 3,500 lumens of color and white brightness1, the 685Wi delivers a dynamic, easy-to-read display up to 100" — from as close as 11" away. Take interactive learning to new heights with dual pen-based interactivity that lets up to two users draw and write on almost any wall or existing whiteboard. Wirelessly display content from a variety of devices — including Chromebooks — using the Epson iProjection™2 App with Moderator device management software3. Plus, it includes a 1-year subscription and support for SMART Learning Suite. Touch-based WXGA ultra short-throw interactive Display(projector) for classrooms. 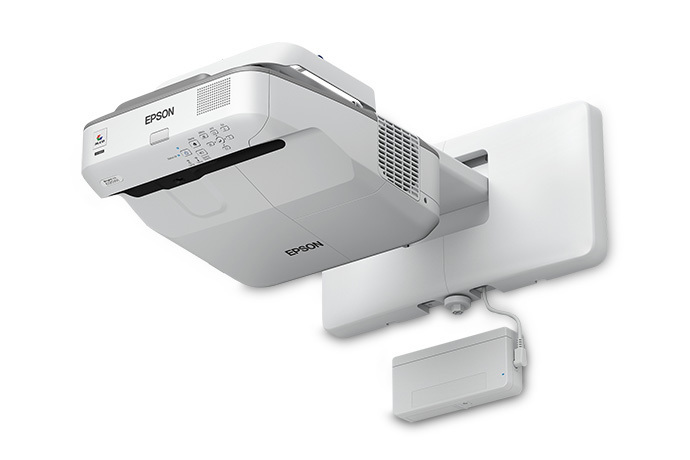 Transform your classroom into a collaborative learning space with the BrightLink 695Wi ultra short-throw WXGA interactive projector. Featuring 3,500 lumens of color and white brightness, the 695Wi delivers a dynamic, easy-to-read display up to 100" - from as close as 11" away. Turn almost any wall or existing whiteboard into an interactive workspace with touch-based interactivity - up to six users at once. Wirelessly display content from a variety of devices - including Chromebooks - using the Epson iProjection™ App with Moderator device management software. Plus, it includes a 1-year subscription to the SMART Learning Suite. Businesses achieve more when meeting are productive, and remote colleagues are able to collaborate as well as teams in the same room. 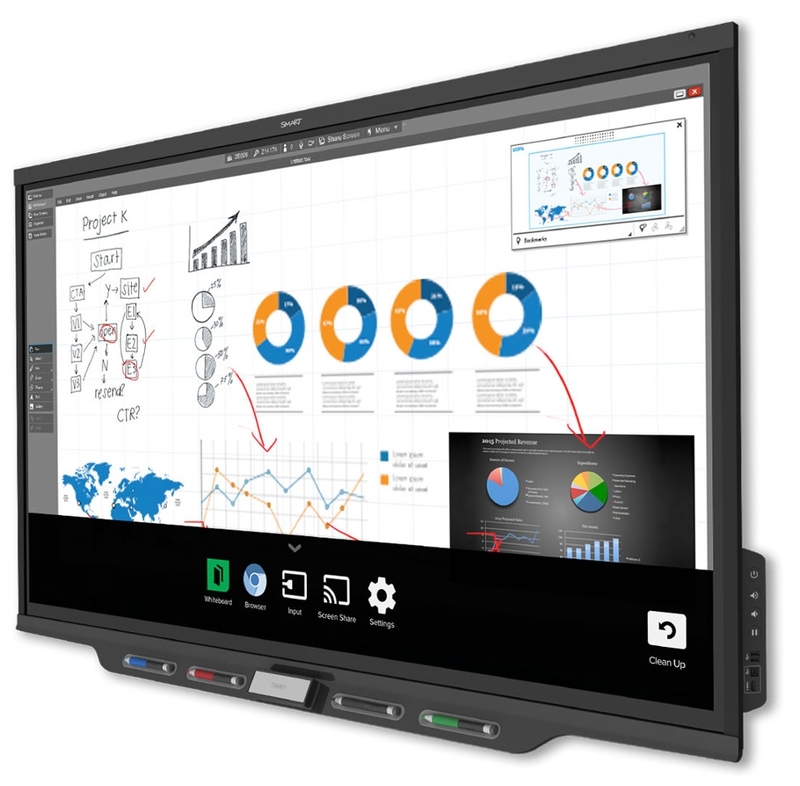 The new SMART Board 6000 Pro series with iQ reduces meeting time by looping in more minds, insights and perspectives at once. It’s a catalyst for innovation in the connected age. SMART Board 7000 series is 25 years in the making, and all new. 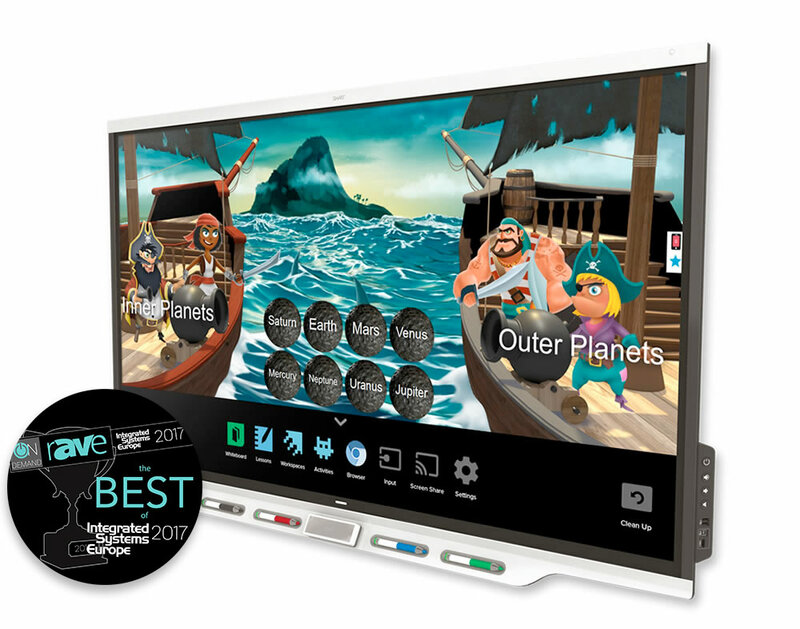 The 7000 series is the digital heart of your interactive classroom experience, connecting SMART Boards and software, devices and vibrant imaginations. It helps students discover talents and passions, and teachers to promote student achievement in exciting new ways. Revolutionary features that raise the 7000 series experience a level above. Easy to afford. Even easier to use. iQ makes everything one touch away. Boost collaboration and engage your audience in the meeting room, the classroom, and beyond with a touchscreen display perfectly suited to your needs.